The Tunisian National Dialogue Quartet: A Model for Asia? On October 9, 2015 the Norwegian Nobel Committee awarded the Nobel Peace Prize to the Tunisian National Dialogue Quartet for “its decisive contribution to the building of a pluralistic democracy in Tunisia.” 1 At the time of the Nobel Committee’s announcement the National Dialogue Quartet, which was comprised of four Tunisian civil society organizations, the Tunisian General Labor Union (UGTT), the Tunisian Confederation of Industry, Trade and Handicrafts (UTICA), the Tunisian Human Rights League (LTDH), and the Tunisian Order of Lawyers, was little known outside of Tunisia. Unlike the country’s major political parties, such as the Islamist Ennahdha movement and the nationalist Nidaa Tounes party, which grabbed international headlines during the country’s parliamentary and presidential elections in 2014, Tunisian civil society’s key role in keeping Tunisia’s turbulent transition on track went largely unnoticed. To be sure, during the summer of 2013, when the Quartet was first formed, Tunisia’s transition was in the midst of crisis. Tunisia’s autocratic leader Zine al-Abidine Ben Ali had fled Tunis on January 14, 2011, marking the first popular revolution that would sweep leaders out of office in neighboring Libya and Egypt during the subsequent months. However, Ben Ali’s departure left Tunis with a political vacuum that was filled by interim transitional authorities until landmark elections were held on October 23, 2011. These elections were not only historic in the sense that they were free and fair, but also in that they brought the Islamist Ennahdha movement into a government that was to preside over Tunisia’s landmark constitution-drafting process. Ennahdha’s electoral triumph upended half a century of secular governance. The result was growing political tension among those who held deep prejudices against political Islam on the one hand, and Islamists who saw the revolution as an opportunity to recast the identity of the Tunisian state on the other. Watch the moment the Tunisian National Dialogue Quartet wins the 2015 Nobel Peace Prize. However, political polarization aside, it would be two political assassinations at the hands of jihadi-salafi radicals in 2013 that would leave Tunisia in a state of political paralysis. With leftist political leader Chokri Belaid murdered in February 2013, and the assassination of Mohamed Brahimi in July 2013, Tunisia’s fragile institutions, in particular its constitution-drafting legislature led by Ennahdha, plummeted into a period of prolonged political turmoil for which there appeared to be no easy exit. 2 Thus, when secular opposition parties boycotted the constitution-drafting assembly and mobilized protests on the streets of Tunis, it appeared as if neither Ennahdha nor the opposition were equipped to comprise. Indeed, Tunisia was not the only country in the Middle East and North Africa that found its transition under stress in 2013. For much of the region 2013 was a painful year that bore witness to a coup in Egypt, which left the country’s first democratically elected president, Mohamed Morsi, imprisoned; the adoption of a draconian political isolation law in Libya that effectively banned anyone associated with the previous regime from playing a part in the country’s transition, a divisive act that set Libya on course for renewed violent conflict; and escalating violence in Syria, which saw the death toll in the Syrian war climb above 100,000. However, the difference between Tunisia and its regional neighbors was that rather than falling into the abyss of conflict, or resurgent authoritarianism, today Tunisia continues to advance along a democratic path. Even in the aftermath of two deadly Islamic State inspired attacks in March and July 2015 that sent Tunisia’s tourism industry into a tailspin, and resulted in the adoption of a controversial counter-terrorism law, Tunisia continues to be widely viewed as the only beacon of democratic hope to have emerged from the Arab Spring. JUNE 6th, 2012 – TUNIS. Tunisian people marching and holding national flags and banners in the city center. What then explains Tunisia’s success and what role did the Quartet play in this success? To answer these questions it is important to return to the tumultuous summer of 2013. With Tunisia’s political parties deadlocked and adopting maximalist demands, such as the withdrawal of Ennahdha from power, it looked as if post-revolutionary violence was imminent. The political divide in Tunisia had worrying parallels with Egypt, where the Islamist Muslim Brotherhood was thrown out of power by the Egyptian military under Abdelfattah al-Sisi. 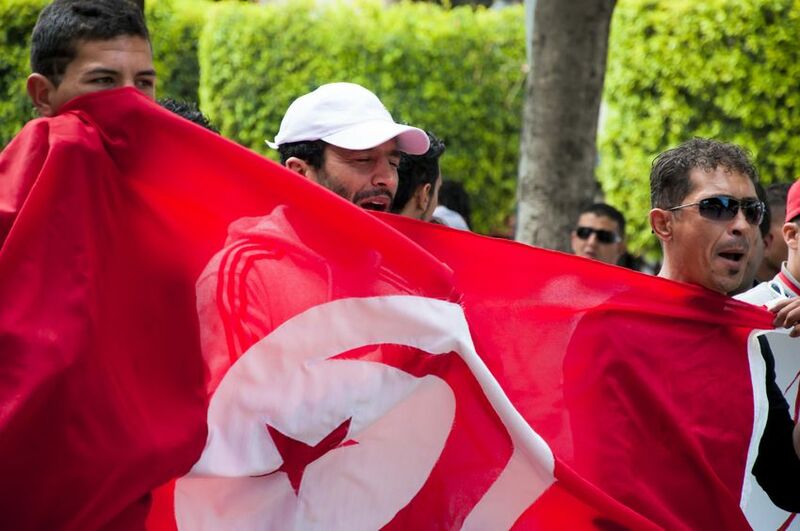 In Tunisia, the Islamist Ennahdha movement too had attracted a growing chorus of criticism and conspiratorial accusations of plots to transform Tunisia into an Islamic state or collaboration with radical jihadi-salafi groups. Indeed, a motley coalition of non-Islamist politicians and activists gathered around the banner of the newly founded Nidaa Tounes party, which was led by the octogenarian former political leader Beji Caid Essebsi who held senior positions under both of Tunisia’s post-independence presidents, Habib Bourguiba and Zine al-Abidine Ben Ali. For Ennahdha supporters the stakes were particularly high. Under the authoritarian rule of Zine al-Abidine Ben Ali, Tunisia’s Islamists found themselves subjected to widespread political repression. Many of the party’s activists had suffered years of imprisonment and torture. Meanwhile, for Tunisia’s non-Islamist political parties, Ennahdha was perceived as posing a threat to a distinctly Tunisian brand of modernism deeply embedded in the very identity of the post-independence state. The increasingly poisonous political environment in Tunisia, that pitted two seemingly irreconcilable political forces against each other, meant that 2013 could have been the year Tunisia’s transition was lost. However, far from being lost, by January 2014, Tunisia would have a new constitution, a transitional justice law, a new technocratic government that would guide Tunisia to parliamentary and presidential elections. With Tunisia’s political parties unable to negotiate a way out of the crisis, Tunisian civil society stepped in to fill the void. Unlike many of Tunisia’s neighbors, Tunisia is a country with a long history of labor movement mobilization and is also the home of the first human rights organization in the Arab Middle East, the Tunisian League of Human Rights. Although Tunisian civil society had been subjugated to the old regime, political change in 2011 created an opening, whereby Tunisian civil society could begin to play a more active role in the country’s politics. Starting from the High Instance for the Protection of the Revolution, members of labor unions and human rights groups assumed leading positions within Tunisia’s interim administration, and also played key roles in negotiating the terms of transition. Although the Tunisian General Labor Union (UGTT) was widely perceived as hostile to Ennahdha, it could draw upon its historic legitimacy to push for a national dialogue in the aftermath of Chokri Belaid’s assassination in February 2013. Following the death of Mohamed Brahimi in July 2013, the Quartet, which had already begun to take shape earlier in 2013, sought to assume a moderating role in the deepening political crisis. During the autumn, the Quartet acted to bring the major political actors together to hash out a roadmap for finishing the stalled constitution drafting process, the withdrawal of Ali Laarayedh’s government under Ennahdha, the selection of Mehdi Jomaa as a compromise technocratic prime ministerial candidate who would preside over Tunisia until elections could be held by the end of 2014. All of these achievements required not only delicate mediation on the part of the Quartet, but also a willingness to compromise on the part of Ennahdha’s leader Rachid Ghannouchi, who in the end voluntarily withdrew his political party from government in the face of growing popular pressure. The involvement of civil society actors in a national dialogue is not unique to Tunisia. For example, there was an effort to launch a national dialogue in Libya as well in 2014. However, Tunisia’s domestically driven national dialogue, which was fully owned and implemented by Tunisians, sets the Tunisian experience apart. The success of Tunisia’s national dialogue rested upon the relative strength of Tunisian civil society and the willingness of political actors to compromise at critical moments in the country’s transition. Despite hostility between the UGTT and Ennahdha, in the end, both played crucial roles in the success of the national dialogue. One important lesson imparted by the Tunisian experience that is relevant for Asia is that often answers to political crises lay outside the narrowly defined political sphere. Political parties and political elites are too deeply embedded within political contests for ownership over transition processes to reflect on the consequences of taking on absolutist positions at a time when institutions, and the wider public, are under intense stress. By taking a more open approach to dialogue and bringing in civil society actors, Tunisia’s transition demonstrates the importance of civil society during periods of transition. Dr. Christopher K. Lamont is assistant professor of international relations at the University of Groningen. He has spent the last four years researching Tunisia’s transition and has organized three summer programs on Arab Spring transitions at the Faculty of Law and Political Science at the University of Sousse.